Padma literally means lotus. This is the posture for meditation. 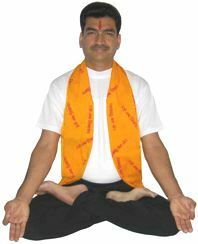 It is the ultimate yoga pose, Padmasana requires open hips and consistent practice. Keep the right foot on the left thigh. Start bouncing the right knee. If the bouncing knee easily touches the floor, then bend the left knee, take hold of the left foot with both hands, gently glide it over the crossed right leg and place it on the right thigh. Stay in the position as long as you can and after that release the pose and be comfortable. It is effective for liver disorder. Those suffering from chronic knee pain should not practice it. Those getting cramps in calf-muscles should practice it cautiously. After keeping one leg on the other thigh, if other leg can not be placed fully on the other thigh, do not try to put it forcefully.